Play putty that bounces, stretches and trasfers comics! 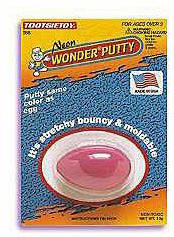 Thirteen grams of non-toxic putty in eggshell carrying case(/i>Assorted colorsSorry, we cannot guarantee color selection. Size (inches): 1.57" X 4.92" X 7.09"